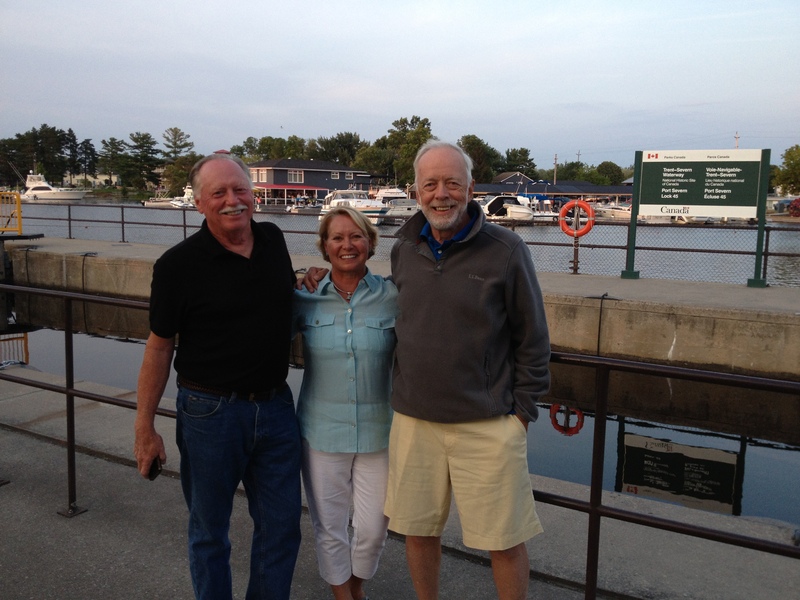 We are currently in Port Severn Ontario, which is the Northern end of the Trent Severn Waterway on the shores of Lake Huron. 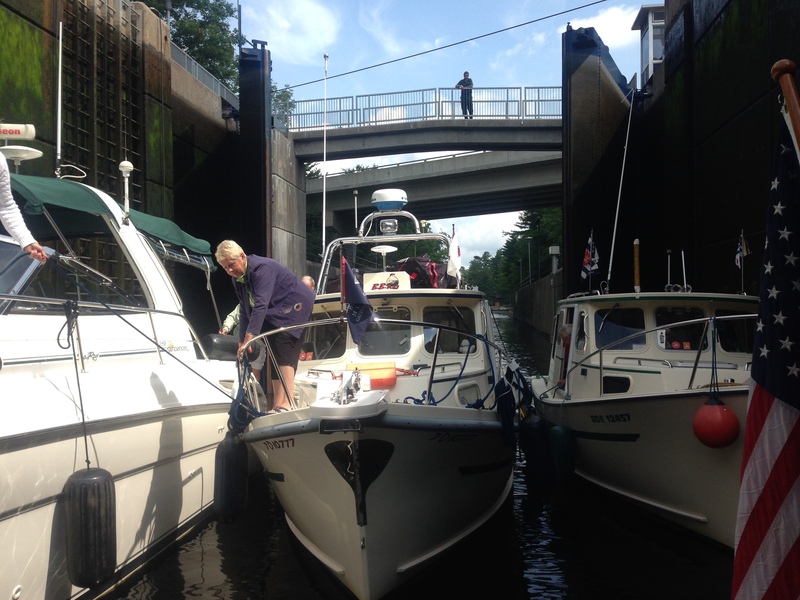 We have completed the 240 mile waterway with its 44 locks. 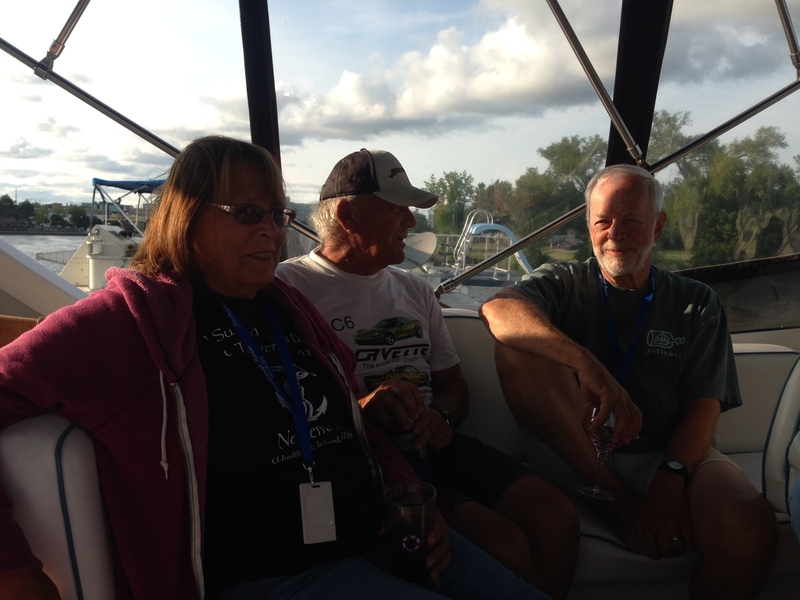 We are looking forward to Lake Huron and Lake Michigan which are lock-free, until we reach Chicago. A view forward while in the rail-car. Yikes! 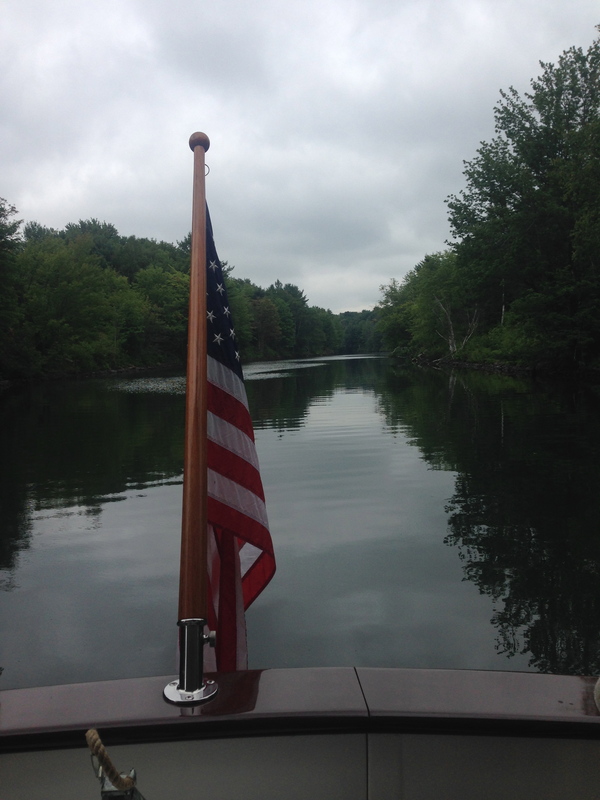 This is a view looking from the aft camera on our boat while we were cradled in the rail-car. 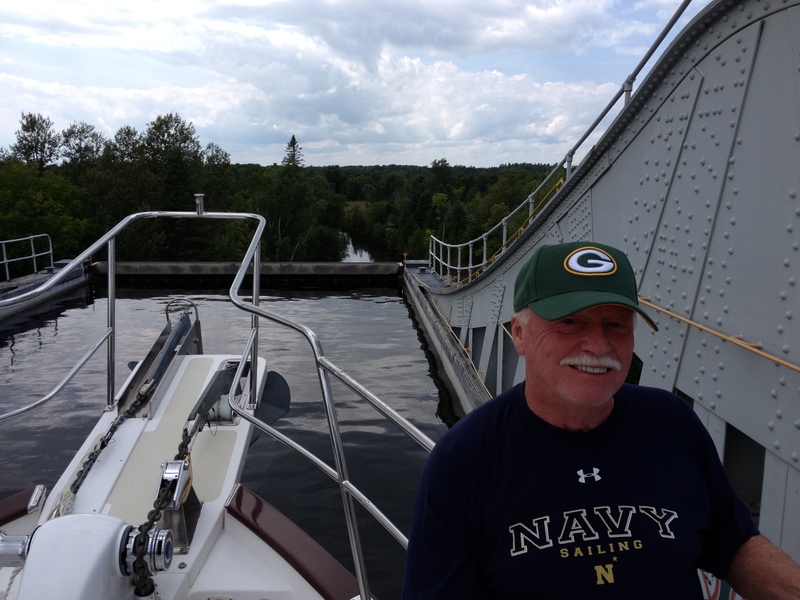 Yesterday we had a unique experience of having the boat put on a rail-car and lowered 90 feet to the next lake instead of using a traditional lock. The theory is that you drive onto a flatbed car and you are held upright with slings cradling the boat while out of the water. However in our case, just as we were entering the car a line squall with strong wind gusts, thunder, lightening, hail and rain came through which made the experience a little more exciting than normal. No damage to the boat, but a lot of stress for the crew. But all survived! We are spending two nights at a wonderful marina. Andy departs tomorrow morning after a two month stay on Next Dance. He is anxious to get back home. He can’t believe that we kept him hostage that long! 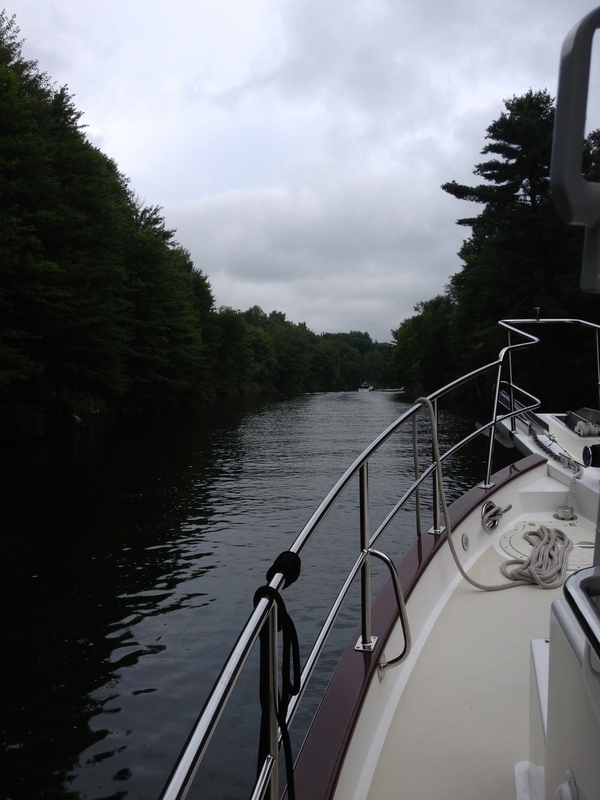 We are also going to take advantage of getting our mast put up today and the dinghy inflated (it was lowered in Troy, New York so that we could get under all of the low bridges between there and here). It will be so great to have the boat looking ship-shape again. Tomorrow after Andy leaves we will enter Lake Huron and run up to the Georgian Bay. Georgian Bay has 30,000 rocky islands along the coast that are supposedly very scenic and provides many lovely anchorages. 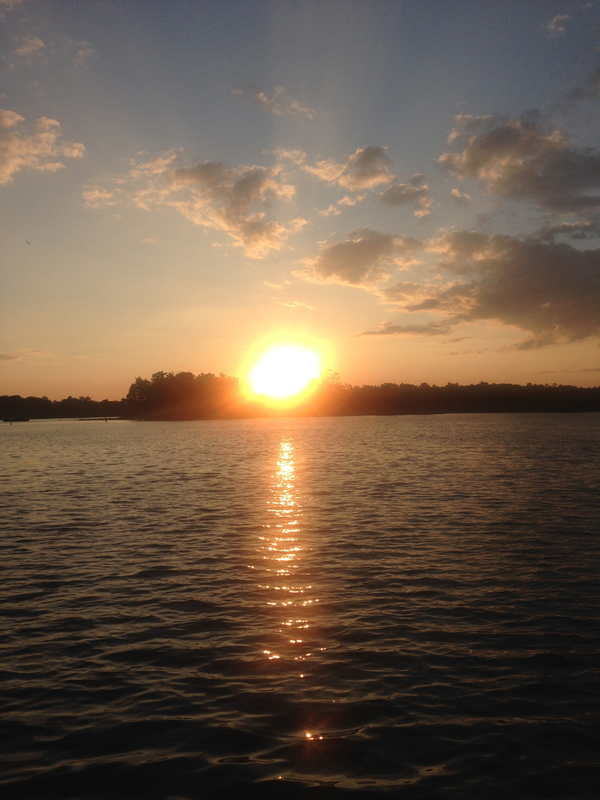 This part of Ontario is lake cottage country and every rocky island larger than 50′ in diameter has a cottage. 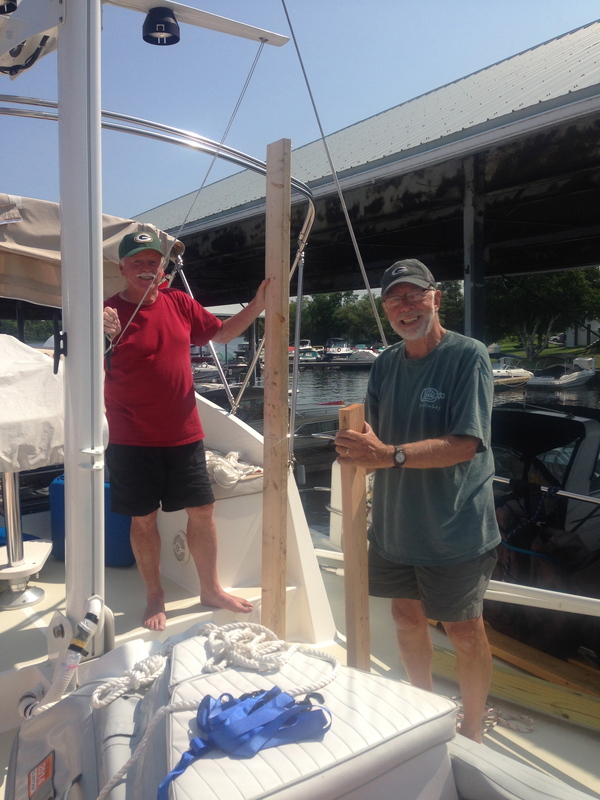 We hope to reach Killarney, which is the boundary between the Georgian Bay and the North Channel, in 5-6 days. Thank you Andy for all of your help and good company. See you in Milwaukee later this month! 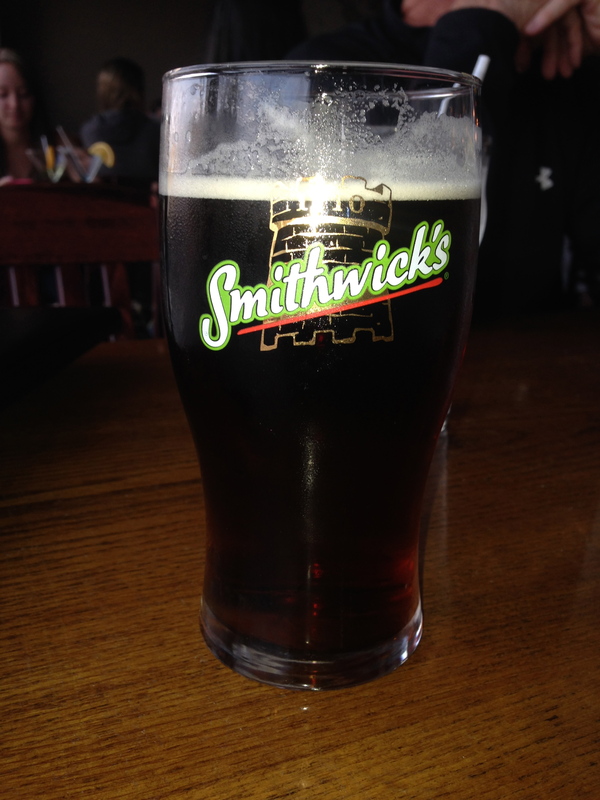 Our last night together in Canada. So far the weather has been generally very good, with occasional rain but no high wind or storms – the exception, of course was our rail-car ride yesterday. Now that we are entering “big water” we hope the weather continues to hold. 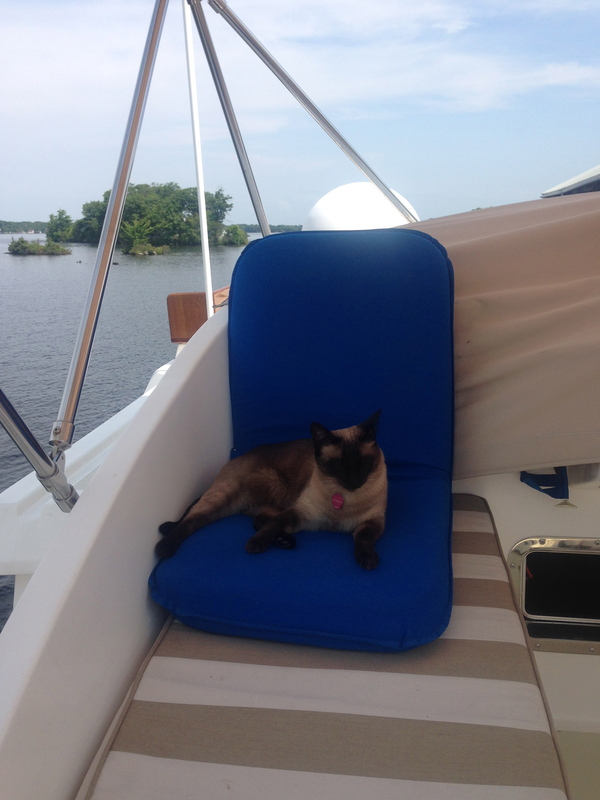 The cats are much happier without the boat bouncing around. Our Kadey Krogen can handle much rougher weather than it’s crew can. As a matter of fact there is currently a 42′ Kadey Krogen (Dauntless) crossing the Atlantic Ocean right now. That is one thing that we have no interest in doing. If we were ever to think about cruising in Europe, we would have the boat shipped over. 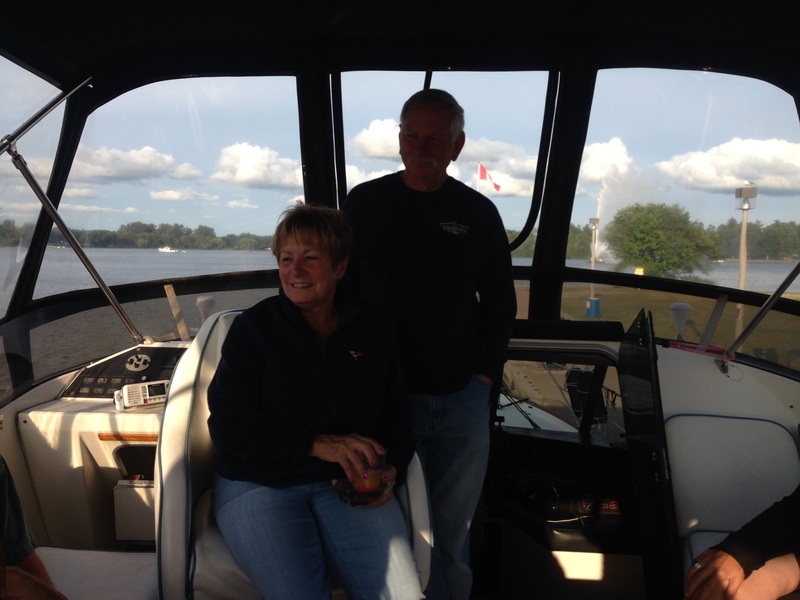 Traveling through the Trent Severn has been an interesting experience going through all of the locks, the lift locks, the canals, the lakes, quaint towns and villages, all of the lovely cottages. 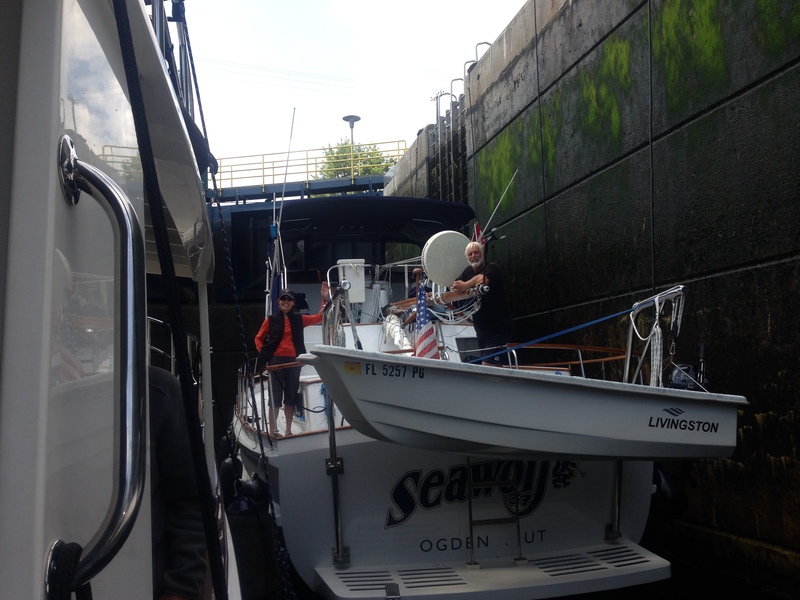 You are allowed to tie up to the lock walls above and below the locks overnight. 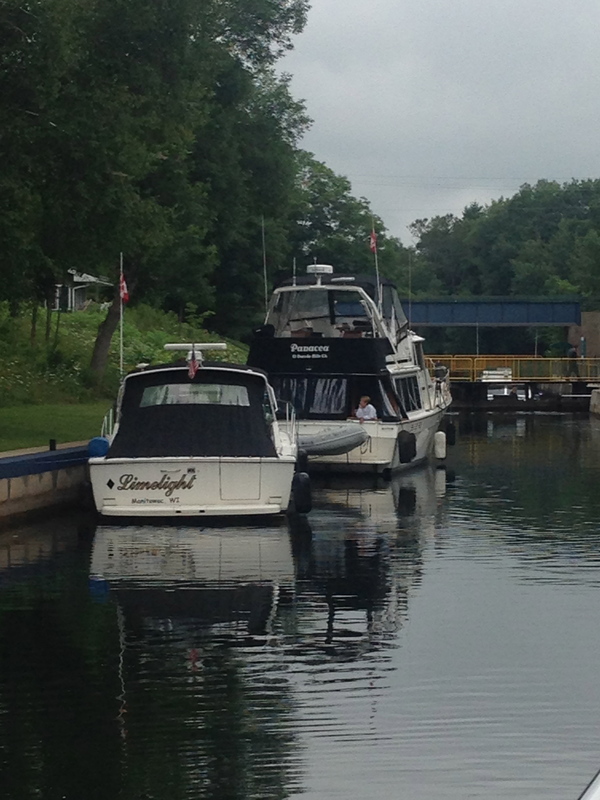 Each lock has bathroom facilities, which have been better than most marinas. Getting “cozy” in the lock. They like to pack you in with not much room to spare. Andy in one of the three “lift-locks” we went through. Narrow canals always an experience. Stay in the middle! 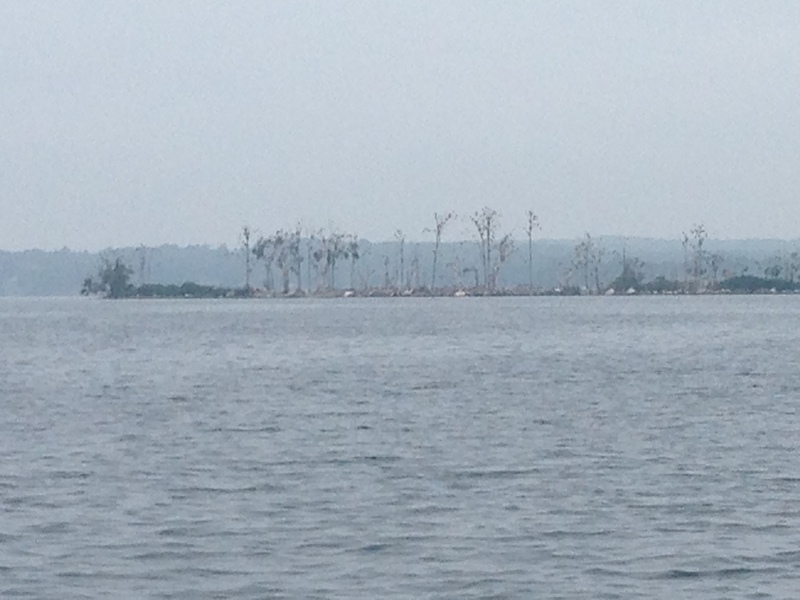 Cormorants destroy the vegetation on islands. There are hundreds of them in the trees. 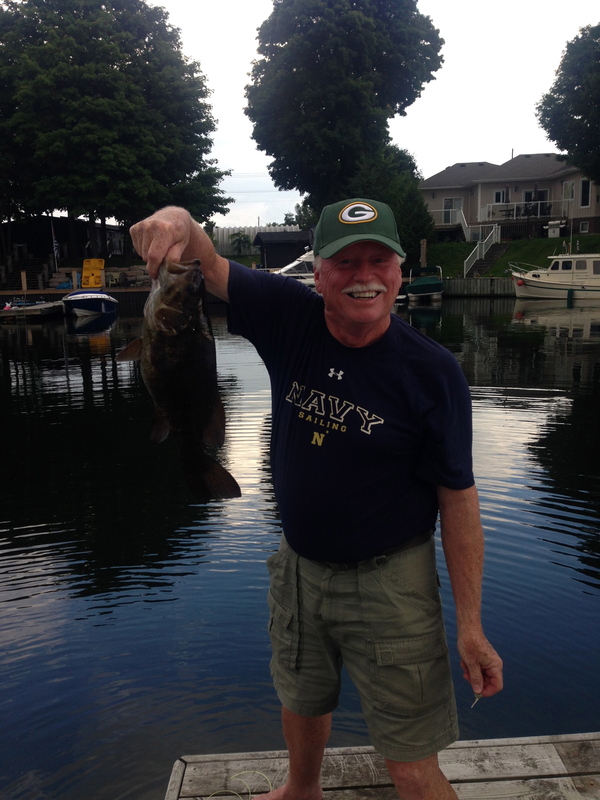 Andy catches a nice big mouth bass! The canals, as you can see, are very narrow and the stress levels go up when you come to a boat coming towards you. The courtesy is to radio ahead and tell oncoming boats that you are coming through so that they can wait for you to pass. However, they have to have their radios on for this to work!! We have been traveling on and off with two other boats – Limelight and Panecea. The owners of Limelight are from Manitowoc, Wisconsin and the owners of Panecea are from Huntington Beach, California. Limelight will be ending their two year Great Loop adventure when they get back in Lake Michigan. Panecea will be continuing their trip until they arrive in Tennessee, where the Great Loop Rendezvous will take place in late September. We are not sure if we will be attending the Rendezvous or not. If we do, we will probably be somewhere where we will rent a car and drive to it rather than have the boat there. There will be over 300 boaters there. Speaking of Panecea, they decided to go on yesterday on to the Georgian Bay. They had just gone through their last lock and were proceeding. Unfortunately they didn’t realize that the marker buoys changed and they hit rocks and bent one of their props. We heard them calling the marina below us to come in for the night, where they had their prop switched out this morning. Luckily there was no damage to their shaft. 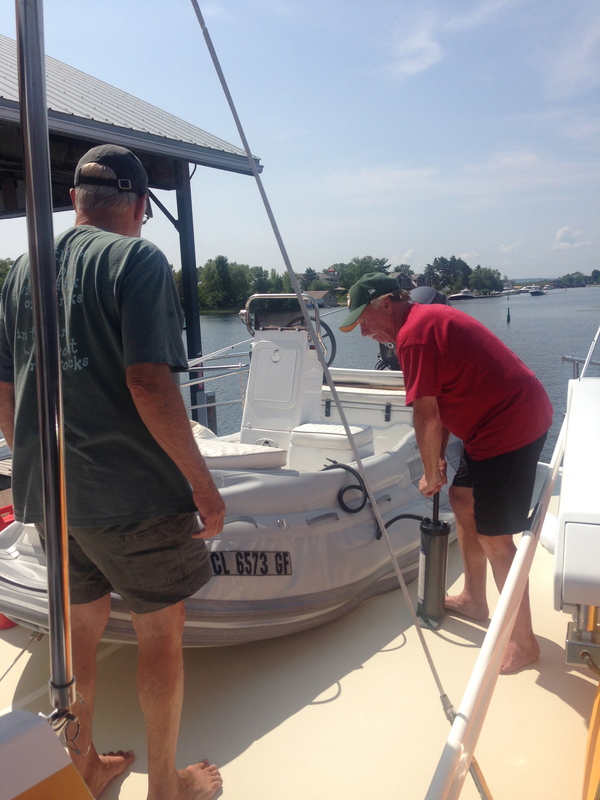 We feel complete once again by getting the mast up and the dinghy inflated. 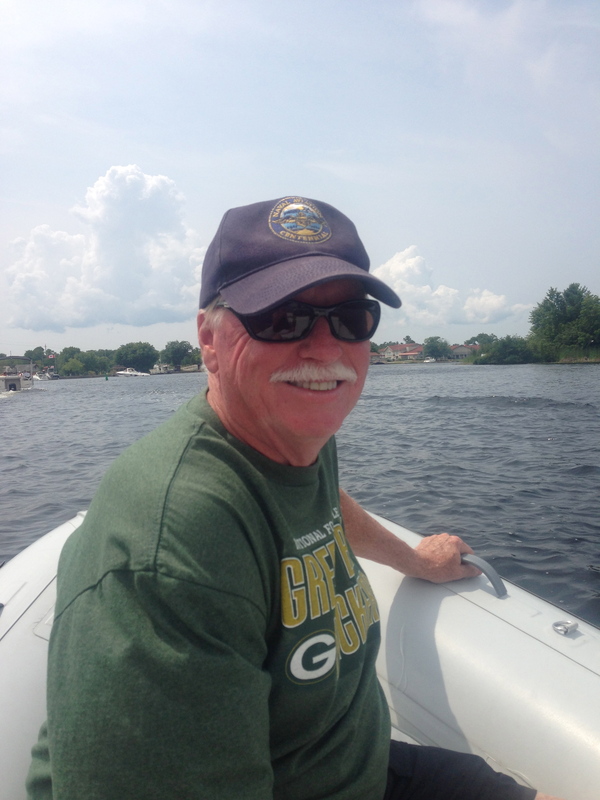 We launched the dinghy and went to a little restaurant on the water for lunch. Tonight our farewell dinner with Andy. Putting the mast up at last! 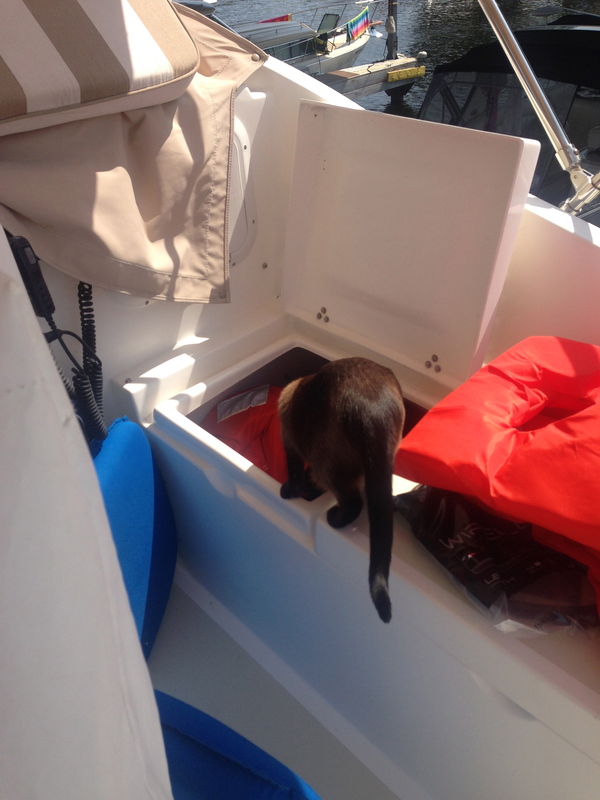 Pema finds a new place to explore! We don’t expect to have internet coverage in the Georgian Bay, so the next update may not be for awhile. I had some time today to try to catch up on your adventures! 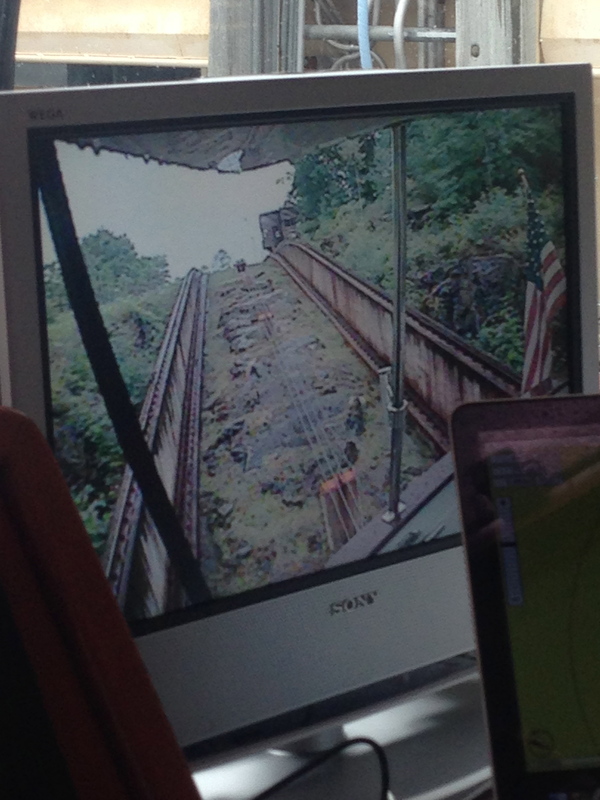 Wow the rail car photos made my heart thump and my palms sweaty. You are a courageous team. 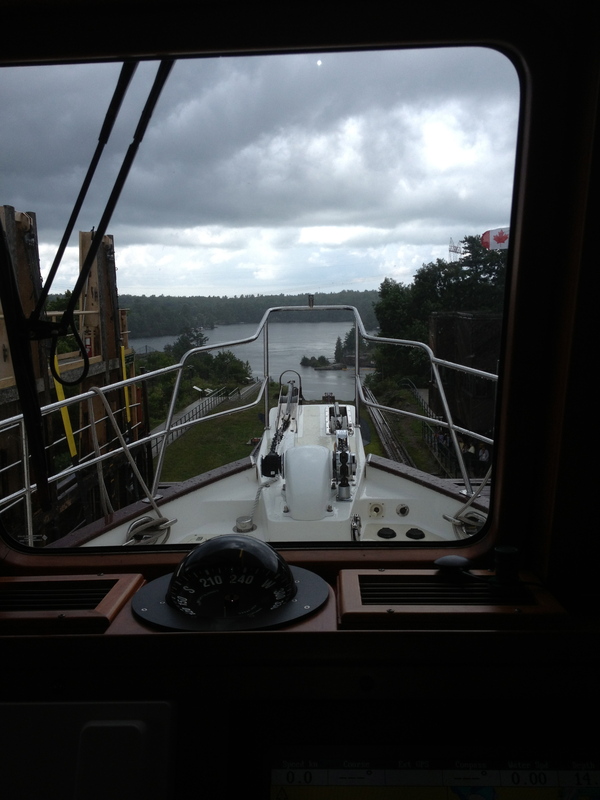 High winds, hail, tight spaces, locks, barges and rails. I thought this was supposed to be a vacation? 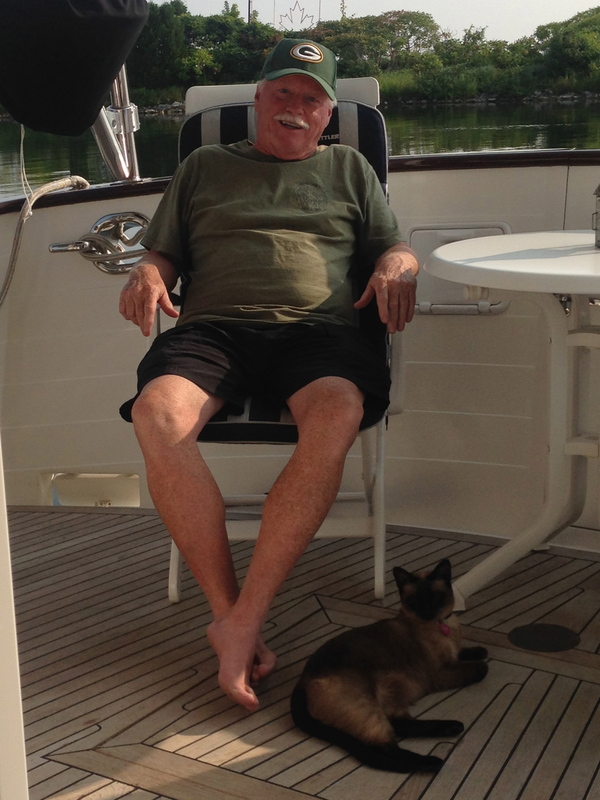 Pema the cat crew looks quite comfortable. Please make sure you leave some time for us when in Milwaukee! Love following your journey! We have discussed doing the Grand Loop ourselves but for now we ate going to settle for ten days of sailing in the BVI come December!